In our series Behind the Scenes, artists answer questions about their creative process, philosophy, and more. This installment features Bill Domonkos, an experimental filmmaker and media artist, whose work combines 2D and 3D computer animation, special effects, public domain photography, and manipulated archive film footage. You can see more of his work, including exclusive Meural commissions here. What do you consume (art, music, books, film) to help fuel your work? To be honest, absolutely everything around me fuels my work. I love movies and reading, I watch at least 3–4 movies a week. Although searching through images and films in the public domain is probably where most of my ideas come from, more than not it’s my jumping off point. How influential is your personal history and/or politics in your work? My work has always been kinda personal, a creative response to the world I live in. Politics of course creep in as well, but I prefer to work in a psychological or aesthetic mode rather than openly political. Describe your ideal work setting. Solitude, the setting could be almost anywhere. Maybe some background music/noise, nothing too distracting, something ambient/experimental/opera/classical. Coffee and electronic cigarettes. I love working in my studio at home surrounded by all my stuff … but I can work almost anywhere. I’ve enjoyed doing a couple artist residences for the simple fact I have no other distractions or interruptions, and they feed me. Send an image of your workspace. I’m currently working on a VR piece, so I’m doing a lot of spinning around in my Oculus Go. Send an image of one of your favorite works of art. My most prized art possessions are things I’ve found at flea markets. 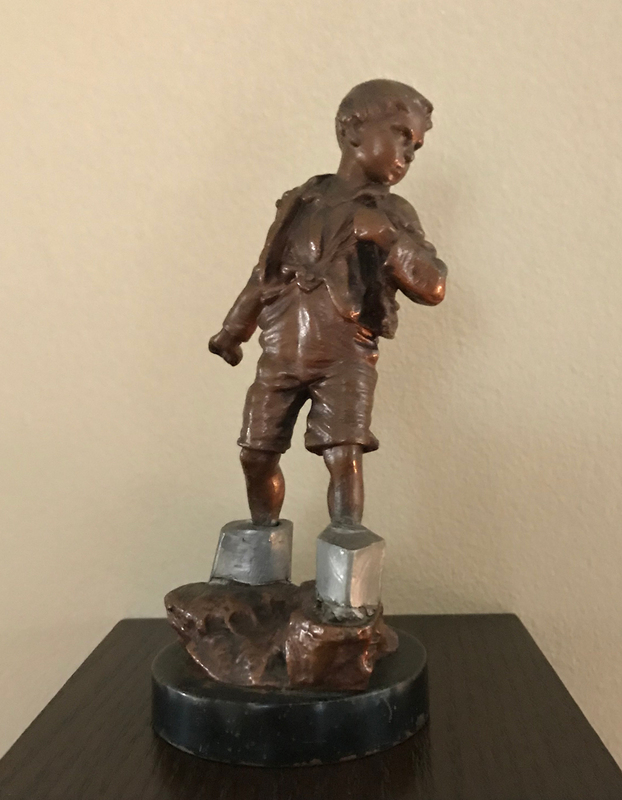 This is one of those things ''The Lead Footed Boy.'' I have no idea why someone put those enclosures around his feet, but it’s pretty awesome ... and only $5. Send an image that makes you feel at home. 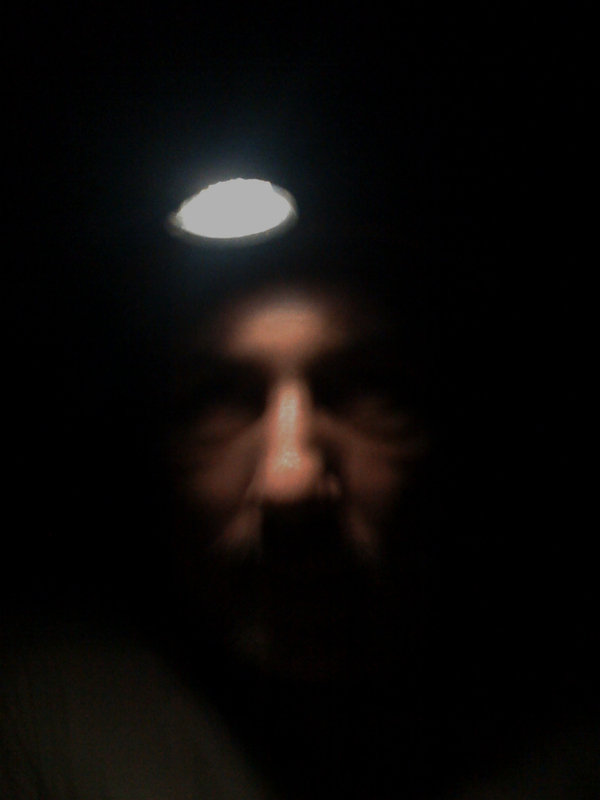 This is a selfie I took in the lava tubes on the Big Island of Hawaii. After having a couple panic attacks squeezing through some impossibly tight spaces … I crawled out into a huge black cave, darker than anything I’ve ever experienced. Lying there in the dark, underground, listening to the sounds of the earth was the most at home I’ve ever felt. What do you feel when you look at your past work? It’s funny how in retrospect I see things that weren’t obvious to me at the time I made the film. I made a short film “Occult Memory Systems” a couple years ago. Looking at it now, it’s so obvious that my two Aunts who were suffering with dementia had a huge influence on that piece … I wasn’t consciously aware of it at the time. How much of your work is accidental? I think a lot of my work comes into being by chance. It’s all about making visual associations between things I’ve seen in the public domain. The back and forth experimentation of combining different elements usually leads somewhere unexpected. Is it better for an artist to take himself too seriously or not seriously enough? For me it’s striking a balance between the two. Sure, I’m serious about my work, but if you’re not having a good time, why bother? Having a sense of humor is really important. If you could have any artist, living or dead, paint a portrait of you, who would you choose? What is your favorite [book / song / movie] of all time and why? “The Clock” by Christian Marclay, a 24 hour film installation that functions as a clock, using film clips synchronized with the real time. I think it’s completely mesmerizing and sublime. It is a testament to our times.